It's always a runner's dream to have that one incredible day where everything is absolutely perfect. For the people running Monday's Boston marathon, the one thing that looks like it will basically be perfect is the weather. Currently, absolutely incredible weather conditions are being predicted for Monday's Boston marathon. The current weather forecast is so incredible that they truly might be described as once-in-a-career weather conditions for a runner. There are primarily two things a runner worries about when racing a marathon on a point-to-point course like Boston - wind and temperature. Take a look at the following two images and try to tell us that the weather and wind aren't ideal for Boston. The Boston course runs Northeast basically the entire 26.2 miles, as the runners travel from Hopkinton to downtown Boston, and 18 mph winds out of the WSW are currently expected. The temperature is expected to be high 40s to low 50s during the elite race, which is nearly ideal - basically perfect. If one were artificially creating the conditions, the only changes one might make would be to lower the temperature by about 5 degrees and make it overcast instead of sunny, as the sun can make it feel a bit more draining. So if you are running on Boston on Monday, our advice is simple: Run smart and fast, as you'll not likely get conditions any better than this during your lifetime - at least your prime marathon lifetime. The Boston marathon did enjoy conditions like this 17 years ago back in 1994 (but most people's marathon primes don't last 17 years), and the results were remarkable. A Chicago Tribune recap of the 1994 race described the weather as being mid-50s with a 19 mph tailwind, very similar to what is expected for Monday. What ended up happening? Well, Kenya's Cosmas Ndeti broke the men's course record by 36 seconds with a 2:07:15. That record time lasted for 15 years in Boston until Robert Kipkoech Cheuiyot (not the one that won last year in Boston) broke it by one second in 2006. It's actually only been bettered one other time - last year, when the other Robert (Kiprono) Cheruyiot ran 2:05:52. On the women's side, the course record was also set in 1994, as Joan Benoit Samuelson's old record was shattered by 58 seconds, with Uta Pippig running 2:21:45, which still stands as the women's course record. Back in 1994, one American also took advantage of the conditions to have a career day. US Olympic marathoner Bob Kempainen, who never ran faster than 2:12:45 2:11:03 in his three other career marathons, produced the then-fastest time ever by an American in Boston as he ran 2:08:47, eclipsing Alberto Salazar's old record by 5 seconds. That US mark stood until Ryan Hall ran 2:08:41 last year. So how much is the 1994-type weather potentially worth? A lot. 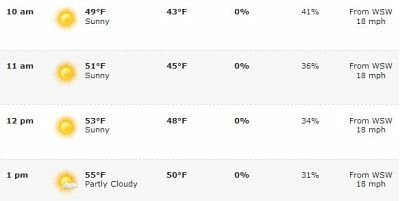 We reached out to LetsRun.com coaching guru John Kellogg to ask him for his thoughts on the weather forecast. "A near-20 mph tailwind might chop three or four minutes off someone's finishing time," said Mr. Kellogg. "A sub-2:03:59 clocking wouldn't actually shock me. I'll tell you this - if Boston had rabbits and the field that is assembled for the 2011 London marathon was running with a time bonus on the line, I'd actually be a little surprised if someone didn't run the fastest marathon time ever recorded." It should be pointed out that even if there is a sub-2:03:59 clocking in Boston, it won't count as world record, as Boston isn't a record-eligible course given the fact that it is a point-to-point course.